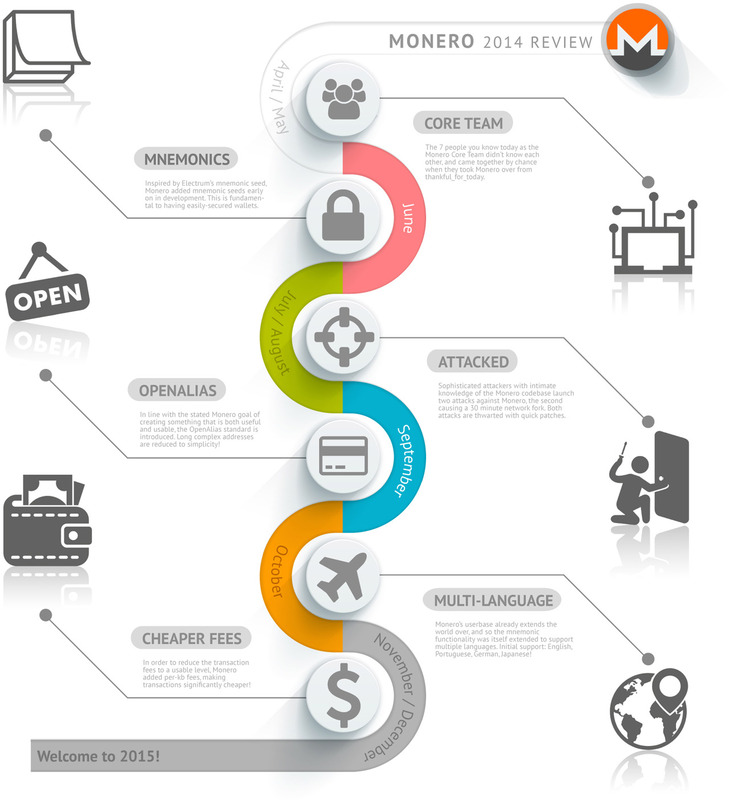 As an open-source project, Monero is built on the back of volunteers, contributors, and donations. So let’s start with a financial report. For donations received over the year: Monero Core Team received 21 636.40655 XMR spread over 4343 transactions, and 8.04559 BTC spread over 25 transactions. Thus average XMR donation is around 5 XMR, and average BTC donation is around 0.32 BTC. As most of costs are BTC based, XMR donations were traded into BTC where necessary (typically through OTC trades and not on-market), giving us a rough total of all receipts of 39.536205689 BTC (in XMR donations) + 8.04559 BTC (in BTC donations) = 47.581795689 BTC. Expenditure for the year comprised of 3 totals as some costs could not be settled in BTC or were preferably settled in XMR. Our expenditure was 190.513492 BTC + 1 891.31 XMR + US $5 732.80, which is around the 212 BTC mark. Thus the shortfall of 164.5 BTC was paid out of the Core Team’s own pockets in the hopes of recovering the funds later on (ie. just in case anyone was wondering, not only do the core team not get paid at all, but we’ve put a significant amount of funds into Monero). Well, let’s start by excluding a lot of development done in branches on forks, and focusing on the master branch of the git repo. We inherited the Monero project pretty much from the end of April, with thankful_for_today’s last commit on April 30th, 2014. In order to see what we did with some pragmatism we took two folders, one containing the Monero source on April 30th at that last commit, and one containing the Monero source on December 31st. We removed everything in the external/ folder, except the CMakeLists.txt, so that we weren’t including external libraries in our count. We then used Araxis Merge to produce a diff report between the two folders (plus Github’s compare tool to give us additional information). We then subtracted the license changes we made earlier this year (208 files were affected, which means that for each we have to remove 2 lines from the “removed” count, 1 line from the “changed” count, and 28 lines from the “inserted” count). The summary is below, and whilst it obviously precludes things like where we made several changes to the same line of code, or missteps we reverted, it gives a very general indication of the effort. Now may be thinking “wow, that’s like 94 lines of code a day!”, but it’s important to remember that included in this are documentation and code comments, mnemonic word lists for several languages, as well as changes made to Bytecoin early on that we merged in.